In statistics we always find measures of central tendency because it always makes sense to compare individual scores to the overall group of scores in order to be able to correctly interpret the result. Individual scores by themselves may mean little but when looked at from a group point of view, they may reveal the whole picture. For example, if you say you saw an insect of length of 10mm it doesn't mean anything by itself. However, if you say that the normal length of the insect is about 6cm and the maximum recorded length ever is 10.4cm, then it may mean you saw a particularly large insect. Therefore it is important to be able to quantify the "normal length" as used above, and this is what central tendency is all about. The arithmetic mean is one of the most commonly used measures of central tendency. For a set of numbers, the mean is simply the average, i.e. sum of all the numbers divided by the number of numbers. Therefore if you want to find the average length of a group of insects, you simply take the length of each insect, add up all these lengths and divide by the number of insects. If the lengths of 5 insects are 6.5mm, 5.4mm, 5.8mm, 6.2mm and 5.9mm, then the mean is (6.5+5.4+5.8+6.2+5.9)mm/5 = 5.96mm. The median is another frequently used measure of central tendency. The median is simply the midpoint of the distribution, i.e. there are as many numbers above it as below it. If the number of data points is odd, then the median is simply the middle number. Therefore the median of 3, 5, 6, 9, 15 is 6. If the number of data points is even, then the median is the mean of the middle two numbers. Therefore the median of 2, 7, 15, 20 is (7+15)/2 = 11. The median is particularly useful when there are a few data points that are vastly different. For example, in calculating the central measure of the salary obtained by a group of graduates, it may happen than a couple of students have got extraordinarily high salaries. This will take the mean of the salaries of the group to very high values, but the median will truly reflect the placement scenario as it is. Another commonly used measure of central tendency in specific cases is the mode. The mode is simply the most commonly occurring value. 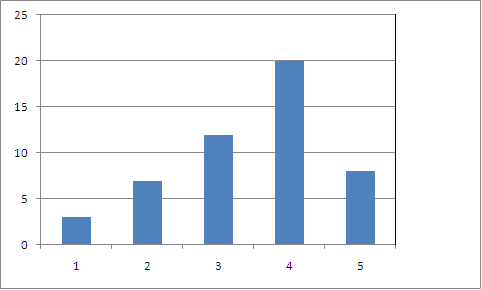 For example, in a class of 50 students graded on a scale of 1-5, the distribution may be as shown in the figure. The mode of this data is 4.